Composite, multiwythe grouted masonry is a versatile solution for a variety of construction situations. Variable wall widths from 8 inches to 24 inches, or more, in 1 inch increments, are facilitated by the length of wall tie used. Note that for normal design conditions, standard types of hollow load-bearing cmu are best for wall construction up through 16 inch widths. For wall widths over 16 inches or for certain design considerations, composite masonry should be considered. The challenge of limited construction clearance, due to zero lot line or existing structures can be mitigated with composite masonry. 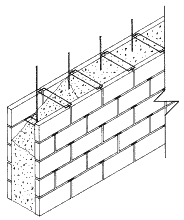 Where it would be impossible to build and strip conventional forms for poured-in-place concrete, multiwythe units can be laid up from one side of the wall after reinforcement is in place. Extreme reinforcement requirements are not a hindrance as multiwythe construction provides a continuous grout space. Thus, solid units maneuver through and around in-place reinforcing bars. Construction consists of solid units, manufactured to the standard appropriate for the code jurisdiction, in two wythes, and tied together by approved wall ties embedded in the mortar joints. The grout space between the wythes contains the reinforcement and is solid grouted. See CBC References.